When the Keyblade was first introduced, its origins were a mystery. Sora received the Keyblade after a prophetic dream whose origin may or may not be the Keyblade itself. It was treated as an important object by the characters around him who knew of its existence. Leon, Donald, and Goofy were all looking for the mysterious “key”, while King Triton decried it as an object of destruction. However, in all that time it was treated as a singular entity – one Key, one character, and Sora was the one to wield it against the Darkness. This gave the Keyblade a mythical feel. No one was scared of Sora himself, but of the weapon he wielded. It was implied that a person had to be a very special sort in order to use it, and that the Keyblade could in fact choose again if it felt that its owner was sub-par. Remember the scene in Hollow Bastion when Riku claimed the Keyblade for himself? In the final cutscene at the end of the game, when Mickey was revealed to have a Keyblade, it was treated as a special occurrence. In short, Keyblades were rare and precious and powerful. With the arrival of KH2, suddenly everybody and their grandmother had their very own Keyblade. The thrill was gone. Then Kingdom Hearts II arrived. A mysterious kid suddenly had a Keyblade, and then two Keyblades. Riku had a Keyblade, and then pulled out one for Kairi as well. In the space of one game, Keyblades are suddenly becoming more common and losing their original mystic nature. The Keyblade itself is only treated as a tool, not a powerful MacGuffin. It certainly still has all of the powers that it held in the first game, the main purposes are to defeat Heartless and opening the paths between worlds–all of that is not lessened. However, how the Keyblade is treated has changed. Is it because the characters have grown in their power and no longer seen the Keyblade the same way? The fact is that the Keyblade is now treated as something that can be given away and traded, not as a rare weapon whose power was to be treated with reverence. 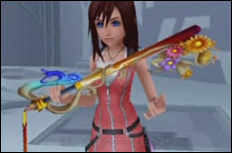 However, this game also added a new dimension to the Keyblade – it didn’t have to start out looking just like a giant key. With Riku’s Way to Dawn and Kairi’s Destiny’s Embrace, the Keyblade gained a bit of variety only seen otherwise with the Keychains Sora collected on his journey. The next major game to change the Keyblade was Birth By Sleep. As a prequel, it establishes that the Keyblade originally started out as a weapon to be handed down from Master to Apprentice. 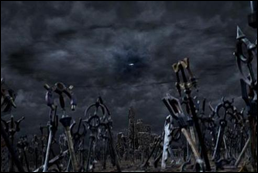 In ancient times, there were whole armies of Keyblade wielders who went to war for Kingdom Hearts and shaped the world of the first two games. In this game’s timeline, there are only three known Masters – Eraqus, Xehanort, and Yen Sid, as well as five known Apprentices – Terra, Ven, Aqua, Vanitas, and Mickey. It’s implied that these are the only Keyblade users in all of the worlds. All of their Keyblades are different in appearance, matching their personalities strongly. This shows how the Keyblade is supposed to be. Rather than being rare and mysterious, as it is when Sora gets his later on, it’s instead supposed to be common. Anyone could be chosen to wield a Keyblade, provided their heart was strong enough, and it wasn’t the Keyblade’s choice entirely. This also strips a level of character from the Keyblade, however. It makes the Keyblade less of a character and more of a tool. The Keyblade is still powerful, but is it mystical at this point? Or is it just a weapon now? Has the Keyblade undergone a decline? That’s a matter of opinion. In some ways its character has expanded from what it was–no longer is Sora the only one tasked with saving the worlds. If he wanted to, he could pass his Keyblade on and go back to a quiet life on the Islands. However, looking at it chronologically, it could be said that the Keyblade’s history and mythos had been on a decline and is starting to come back. Going from hundreds of wielders in the distant past, to eight to ten years prior to Kingdom Hearts 2 or to only Sora and Mickey in Kingdom Hearts I, is quite the fall for a mystical weapon. The fact that more characters are starting to wield Keyblades is a sign that the Keyblade itself is regaining what it had lost before. It’s hinted and teased that Aqua, Terra, and Ventus are going to come back, and from there even more Keyblade Wielders and Masters can arise. Sora’s role in the series may even shrink since he’s not the only one using the Keyblade anymore. If the Keyblade truly was supposed to be used by everyone, then there’s only one logical step for the series to take. A Kingdom Hearts MMO would be the true pinnacle of what the Keyblade is supposed to be – thousands of characters running around and using the Keyblade to protect the worlds. Our question to you is: how do you personally feel about the history and mythos of the keyblade, given your game-to-game impressions? Then, following Quatre Winner’s bold two cents on a KH MMO, how would you like create your own character and take part in a keyblade war of the future? Quatre Winner is the author of one of the top read guest blogs of the year. Read her other work, A Case of a Sleeping Heart, that talks about how Ven’s heart exerts its influence within Sora.